Provencal-inspired ratatouille with eggplant, zucchini, yellow squash and red bell peppers is THE dish to make from a summer abundance! If ever there was a summer comfort food, ratatouille has got to be it. It’s a dish I eagerly look forward to making every summer when our garden goes into high gear — and it has officially done that! There are endless variations of this stewed vegetable dish that originated in Nice in southern France. Ratatouille typically contains eggplant, bell peppers, zucchini, tomatoes and fresh herbs, all of which are abundant now. In some versions, the vegetables are simply combined and cooked together for a long period of time until they become very soft. In other versions, the vegetables are sautéed or browned in stages, combined and then stewed in the oven or on the stovetop. I prefer the latter and only briefly simmer the stew on the stovetop so the vegetables retain their texture. Eggplant is one of the main ingredients. It’s commonly believed that eggplant automatically has to be salted before cooking to draw out the bitterness. I think it’s personal preference. Eggplant normally has a mild but pleasing bitterness. It’s only when an eggplant gets large and seedy that it develops a pronounced bitter flavor. For this dish, I salt the eggplant because it will absorb less oil when cooked. Extracting liquid from the eggplant makes it less spongy and more firm, resulting in less oil absorption. After draining and before cooking, pat dry with paper towels to remove the excess moisture and salt. Another reason I love ratatouille is it’s so versatile. Enjoy it over brown rice, quinoa, couscous or with crusty, toasted or grilled French bread. It can be served hot, room temperature or even cold. You can make it ahead, cool and serve it the following day — the flavor will be even better. 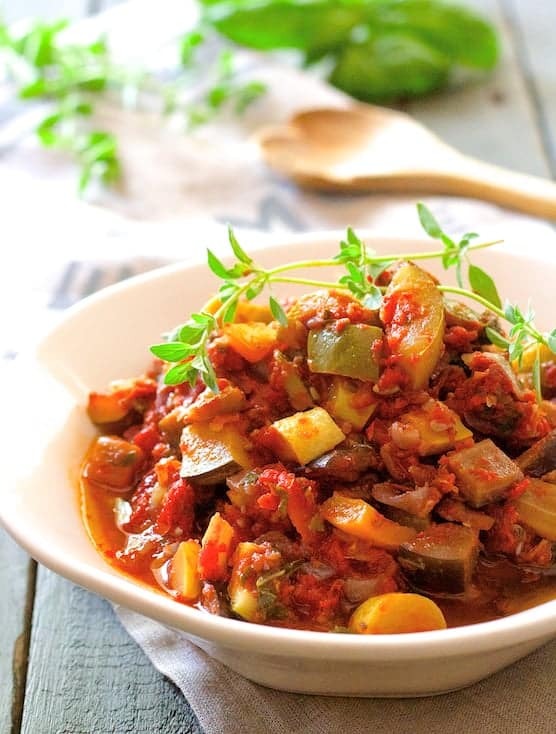 Provencal-inspired ratatouille with eggplant, zucchini, yellow squash and red bell peppers is THE dish to make every summer with a garden abundance! Place eggplant in a colander, sprinkle with salt and let drain in the sink or over a bowl. Meanwhile, heat olive oil over medium-high heat in a Dutch oven. Add the onion, reduce heat to medium and cook 3-4 minutes. Add the red bell pepper and continue cooking another 4-5 minutes or until both are lightly browned and beginning to soften. Transfer to a bowl and set aside. Add zucchini and yellow squash and cook 3-4 minutes or until lightly browned. Transfer to the bowl with onion and red bell pepper. Refresh oil if needed. Pat eggplant dry with a paper towel. Add eggplant to pot and cook 4-5 minutes or until lightly browned and softened. Add tomatoes and cook 1-2 minutes. Add wine, bring to a boil. Add crushed tomatoes, bay leaf, oregano and garlic. Return vegetables to pan, reduce heat to medium low and cook 15-20 minutes or until vegetables are tender. Season to taste with salt and pepper. Remove bay leaf. Stir in basil. Serve topped with crumbled goat cheese if desired. I’ve heard so much about ratatouille and knew loosely what it was but had never seen the ingredient list until now. I love everything in this and know that I will love it. I can’t wait to try this. Thank you for sharing! Hi, Stephanie, Thanks so much and hope you enjoy! I made your recipe tonight and even though I didn’t have any crushed tomatoes or wine, it turned out so delicious! Awesome, Aryane! Thanks so much for your feedback and I’m so glad you enjoyed! I think beans in it would be great! When do you add the herbs,garlic and wine?! Thanks for catching that! Somehow an entire paragraph vanished from my recipe. I’ve fixed it. Thanks again! I love all the fresh produce in this! What a fabulous summer recipe! As a kid I never liked Ratatouille, I had to train my taste spuds and now….oh my…just reason your Ratatouille’s ingredients list makes me drool. Will definitely have to try this!!! Thanks, Lorena! Not a summer goes by that we don’t make this and I enjoy every bite! Hi Carol – this looks really good. I’ve got zucchini and tomatoes growing like crazy so this will be a great way to use them up. I also love any recipe that calls for wine – since I get to drink the rest :).